Impressive! Take your kids on a museum scavenger hunt. Museums get a bad rap. They can be dark, dank, dull, dusty and a place where kids avoid. Not this one. The huge building on the hill in Northwest Dunn Center holds the passageway to the past. Overlooking the historic Dunn County valley is the Dunn County Museum. It is bright, clean and fun. The museum folks cater to children. During the school year, they even host a school day in which children dress in period clothes, walk to school (or at least a half mile or so), eat from lunch pails and learn from a chalkboard. Children are in the roots of the Dunn County Museum location. Perched on the hill where another generation went to school, a winding road leads to a virtual time machine of solid, tangible days gone by. Families have a choice: which way to go when they step into the portal and each turn opens new visions of yesteryear. One of the larger pieces in the many buildings that make up the Dunn County Museum is the fully restored U.S. Army Cavalry Wagon. Children are directed to the collections that they identify with — cars, horses, farm equipment, churches, fashion, schools, and (if it’s the right time of year) gardens. When they enter the Dunn County Museum, they are presented with a huge area of well-crafted displays. Museum staff and assistants on this journey to the past take their responsibility seriously. With daily effort, they give life to what had been dissolving into the prairie. “We’re the keepers of history. If we didn’t keep these items, people would lose a connection with their parents and grandparents. It gives people a sense of appreciation for what they have now compared to back in the ‘good ol’ days,’ ” said Susi Weisz, the Dunn County Museum Curator. “Everything you look at brings back memories,” said Cathy Trampe, Dunn County Museum Chair. A step back in time reminds families that laundry day used to be a major endeavor. Pull off of Highway 200 and drive north through the town of Dunn Center, up the hill to the west and into the thorough and rich gateway to Dunn County’s story. Follow the signs in Dunn Center to get to the Dunn County Museum. From days of early man on the prairie, through the Wild West, through the county’s development, visitors mentally enter into the lives of earlier generations. Many people schedule their trip to coincide with the annual Cream Can Supper. The annual Cream Can Supper Coming gives kids and families a different taste of the past. The cook at the fundraiser uses cream cans to prepare supper: a corn, cabbage, onion and sausage mix. Other people bring desserts or make ice cream on the spot while local musicians entertain. Do your kids know how to crank an ice cream maker? Have you done that? The Dunn County Museum is rich with the history of regional churches of all denominations such as this display that includes the Vang Lutheran Church memorabilia. Trampe said, “Everyone who comes here has their own likes. Some come for the artifacts, some like the homesteader shack, some come for the church display.” Local rural churches at one time served many purposes from religious services to social gatherings, even political events were at local churches. Most of those rural country churches are gone now, but some of the beautiful items from those churches are at the Dunn County Museum, from hymnals to stained glass windows. The 1929 Nash on display at the Dunn County Museum is the result of meticulous work on what was just a junk body in a prairie south of Dunn Center. Trampe has her own favorite item in the multi-building collection; it’s her 1929 Nash on loan to the museum. The exquisitely restored car was rescued from a nearby pasture and rebuilt piece by piece. It sits with other restored vehicles in the transportation building. A fully restored one-room school-house hosts a local class in the spring. The museum is actually several buildings, some of which are joined together. Children are encouraged to explore them all. With an active imagination, they can see themselves in the school displays. One is inside the main building, segregated neatly with desks, chairs, and tools of the school. The other school display is in a restored school build. Here’s the link to see what is in store for you when you take your family to the Dunn County Museum. A Twin City tractor is one of the rare tractors on display. Farm equipment sits outside at the Dunn County Museum, but plans are underway to add to the collection when they can be housed indoors. Even as the Dunn County Museum provides entry to the past, organizers are looking to the future. Fundraisers and raffles help the museum build a planned agriculture building including an exhibit of ready-to-farm antique tractors. The path to the future also includes plans for the big white building at the entry to the Museum lot, the former Manning bank building. As money is available, the bank interior will be furnished with original banking decor the museum already has on hand. If the Dunn County Museum is truly a portal to another time, this building represents the portal to the future. That’s because museum officials hope to raise enough money to beef up the bank building and install the memorabilia already on hand. The museum is on a growth path to create the portal for visitors step through to discover, preserve, and interpret the history of Dunn County and its role in settling this region of North America. What are other museums in Western North Dakota do you recommend? Make a day of it. The kids will remember it forever when you include a picnic at Lake Ilo. It’s just down the road two or three miles. Get tips and ideas on what to see and where to go in Western North Dakota. Just subscribe! The subscription box is at the top right hand on this page. 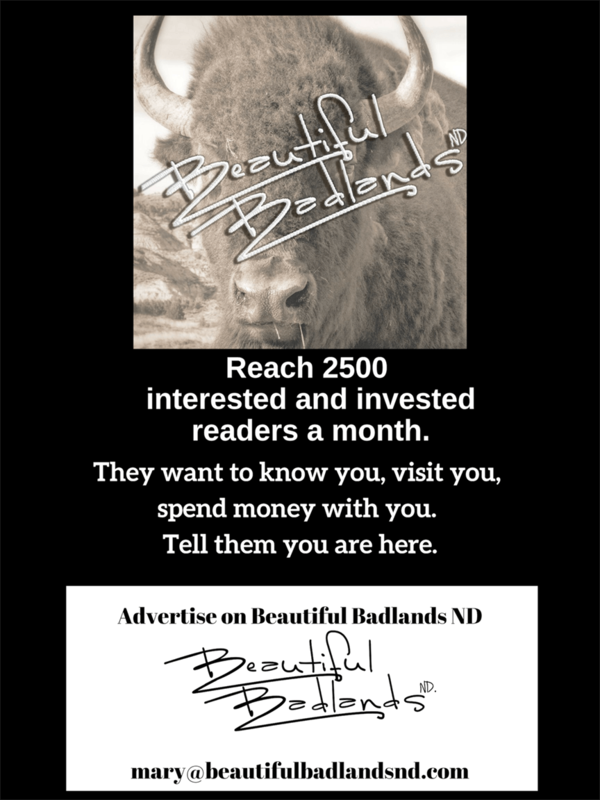 Or follow Beautiful Badlands ND on Facebook.